Contact lenses are available in either soft or rigid gas permeable form. Contact lenses need to be changed daily, weekly, bi-weekly, or monthly, depending on what type of lens you select. Specialized contact lenses, such as bifocal contact lenses, are also available for patients with special eye conditions. 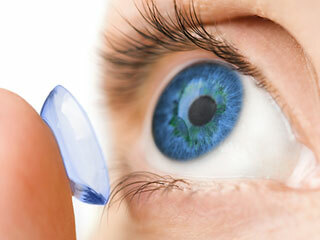 Call us at (718)-297-2997 if you are interested in learning if contact lenses are a good fit for you. Advances in contact lens technology have created great options for cosmetic and prosthetic lenses. Custom contact lenses can be created to camouflage any color variation or irregularity and produce a natural eye color. Cosmetic lenses are also available to transform your eye color. Call us at (718)-297-2997 and speak to our knowledgeable staff if you are interested in modifying or changing your eye color with contact lenses.